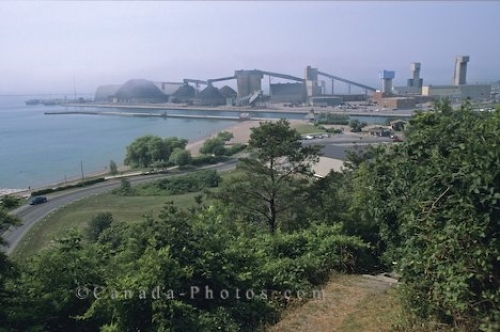 The salt mine along the harbour of the town of Goderich, Ontario is partly encompassed by the fog that lingers in the early morning. The industrial area of the salt mine stretches for five kilometers along the water's edge and is the largest of the salt mine businesses throughout the world. Industry, Goderich, Ontario, Canada, North America. Picture of the industrial businesses along the waterfront in the town of Goderich in Ontario, Canada.